There has been increasing focus on tackling the growing burden of non-communicable diseases (NCD) in crisis settings. The complex and protracted crisis in Syria is unfolding against a background of increasing NCD burden. This study investigated factors influencing implementation of NCD healthcare in Syria. This is a qualitative study, whereby semi-structured interviews were conducted with fourteen humanitarian health staff working on NCD healthcare in Syria. Challenges to NCD care implementation were reflected at several stages, from planning services through to healthcare delivery. There was a lack of information on unmet population need; little consensus among humanitarian actors regarding an appropriate health service package; and no clear approach for prioritising public health interventions. The main challenges to service delivery identified by participants were conflict-related insecurity and disruption to infrastructure, hampering continuity of chronic illness care. Collaboration was a key factor which influenced implementation at all stages. The historical context, the conflict situation, and the characteristics of health actors and their relationships, all impacted provision of NCD care. These factors influenced each other, so that the social views and values (of individuals and organisations), as well as politics and relationships, interacted with the physical environment and security situation. Infrastructure damage has implications for wider healthcare across Syria, and NCD care requires an innovative approach to improve continuity of care. There is a need for a transparent approach to resource allocation, which may be generalisable to the wider humanitarian health sector. Non-communicable diseases (NCDs) were responsible for 39.8 million deaths worldwide in 2015 . Most of NCD deaths are caused by cardio-vascular disease (CVD), diabetes mellitus (DM), chronic respiratory disease and cancer . Rising NCD rates are partly attributable to an ageing population, but also to changes in environmental and lifestyle behaviours including obesity, smoking, physical inactivity and alcohol consumption . NCD rates and associated risk-factors have been steadily rising across the Eastern Mediterranean region in recent decades [3–5]. NCD prevalence in Syria has increased since 2000, with an estimated 40% of adults now at risk of CVD and DM . NCD-related mortality in Syria is also rising, a trend maintained when standardised for age [7, 8]. Pre-conflict Syria had some of the best regional health indicators [4, 9] and produced more than 90% of its medications in-country . However since the Syrian War began over 7 years ago, this picture has drastically changed, with 13.5 million people now in need of humanitarian assistance . By 2015, 4 in 5 Syrians lived in poverty; and by 2016, almost 1 million people were in besieged areas, suffering restrictions to healthcare, food and water . Only half of aid convoys reach the population due to blockades . Healthcare facilities have been attacked  and by June 2017, only 49% were fully functioning . Humanitarian health responses for Syria were coordinated through UN-activated clusters  with three geographic hubs (Damascus, Turkey and Jordan) at the time of this study. Healthcare in opposition-controlled areas was mostly provided by local healthcare workers, supported by remotely by non-governmental organisations (NGOs) . Conflict increases the need for healthcare, while reducing health system capacity . NCDs have been increasingly recognised as a problem in conflict areas but this is still a new area of work [16–19]. The UN Interagency Task Force (UNIATF) [20, 21] produced a strategy for NCD care in emergencies . However, providing NCD care requires not only understanding the burden and technical guidelines [23, 24] but also a reliable supply of affordable medications, and access to trained healthcare workers and equipment. Reduced access to healthcare and disrupted pharmaceutical supplies cause treatment interruptions [17, 25, 26]. Evidence on effectiveness and cost-effectiveness of NCD interventions in crises is limited [16, 19] and resource allocation is a challenge in these contexts  due to the immediacy of competing needs, limited resources, and lack of focus on NCDs in emergencies by both donor agencies and healthcare providers [17, 18]. Currently 6.3 million people are displaced within Syria  but information on the health of Syrians within Syria is limited . Internally-displaced persons (IDPs) are particularly vulnerable even when compared to refugees, with increased mortality  and fewer protection mechanisms . We wished to explore factors impacting provision of healthcare in conflict settings by using NCDs during the Syrian War as a case-study. In this context, care to opposition-controlled areas is mostly supported by the humanitarian response system, as outlined above. Therefore we focused on factors influencing this pathway, from policy to implementation. Such insight could help healthcare providers at national and international levels plan responses . We carried out a literature review to further contextualise the references. For brevity’s sake, the methods and results of this review are presented in Additional file 1. A qualitative approach was used to gather data from a range of stakeholders involved in NCD healthcare strategy and delivery. A semi-structured interview approach was used to allow flexibility and facilitate open discussion. We elected against focus groups as this method could have discouraged participants from freely expressing views, particularly in a context where security concerns limit information sharing . We developed an interview guide in consultation with academics and NGO workers, to include open questions around challenges in NCD care delivery, resource allocation, funding and collaborations. We piloted it for clarity and appropriateness with a small group of participants, and refined it based on their feedback. Participants (n = 14) had worked in Syria with the World Health Organisation (WHO) (3 participants), for international NGOs (iNGOs) (6 participants) or were Syrian health actors in opposition-controlled or contested areas (5 participants) (Additional file 2: Table S3). Participants gave written consent to participate in the research and all data were made anonymous. The interviews were conducted by Skype during June–August 2017 in English, and one in Arabic via an interpreter. Interviews were recorded, transcribed, and uploaded onto NVivo © software (v11). Thematic analysis methods were used [31–33], whereby data were compiled, disassembled and re-assembled . The thematic analysis method was used as it allows themes and patterns to emerge from the data and can inform policy implementation . This analysis started from the first interview, so that data collection and analysis were iterative. Data were coded by allocating phrases and sentences to nodes and sub-nodes. Sub-nodes were grouped together to re-assemble the data into a hierarchical array with the primary data being consulted to ensure themes were representative. 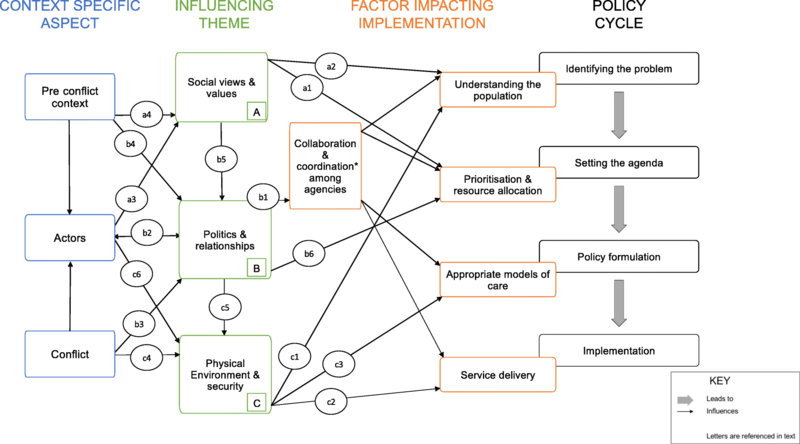 Previous researchers have used models to categorise factors influencing policy creation, adoption and adaptation, including Walt and Gilson’s framework [34–36] or Kingdon’s agenda-setting streams . The framework for this study (Fig. 1) was developed using a bottom-up approach based on key themes emerging from the data, compared to these existing frameworks in the literature. Emergent themes from the analysis were mapped onto five key sequential areas of challenge in the cycle, from policy-setting to implementation (Fig. 1): understanding population need; prioritisation; determining appropriate healthcare models; service delivery; and collaboration and governance. The first challenge to emerge was identifying the problem itself (Fig. 1), as there was a lack of consensus on the need for NCD care compared to other health services. There are several components to health needs: the population’s perceived needs, both expressed and not expressed; the professionals’ perspectives on what a population needs; and a relative health need, based on what is known about other populations . Participants reported a lack of population level data, and interviews revealed disagreement about how to allocate resources among different health services, especially between care for war trauma and other urgent cases, versus treatment for chronic disease. One international participant recognised the population did not adequately identify their own needs: “there’s a lack of knowledge […]; how do [patients] know that [they’re] not well as some NCDs are silent?” Such unawareness would reduce demand for NCD services. There was no cohesive health information system analysing NCD morbidity and mortality. Needs assessments were based on incomplete service data and HeRAMS (Health Resources and Services Availability Monitoring). Several participants from all backgrounds described the lack of patient voices. One international participant reported: “There’s this assumption made about the population’s health solely from the health facilities, so it’s already biased.” One international participant added that “we have also been thinking about people who are housebound, people with mobility issues, those invisible people.” A WHO participant stated that “culturally…the patient voice is not very much heard.” This made it difficult to understand unmet population need. Many participants felt projects were donor-driven rather than needs-driven, with a WHO participant suggesting that “this is more a provider-driven system than a response”. An international participant described a gap between what donors would fund, and population needs: “A Syrian NGO recognised NCDs was a problem, but said the donors won’t give funding.” Overall service planning was described as a predominantly top-down approach, rather than based on population need. A local participant reported the challenge of creating continuity of care contrasted with the brevity of funding: “Most funding is one year or six months, you would not be able to develop anything.” Therefore it was challenging to plan for long-term risk reduction strategies for patients when organisations in these contexts classically focused on emergency care and immediate health gains. Overall there was no consensus on the population need for NCD healthcare, and multiple other competing priorities for this population. The second challenge to emerge was prioritisation within NCD care (Fig. 1). Prioritisation is a systematic approach to allocating limited resources. This process of ranking needs is complex and requires understanding population needs. Funding allocation in crises is complex, and is often directly linked to specific contexts or objectives. At the global level, NCD-specific funding is difficult to measure as it is mostly subsumed within general healthcare funding . Should there be limits to care? Overall, there was no agreement on priorities within NCD healthcare by participants, and how to approach the prioritisation process in a crisis setting. Allocation of resources between and within health services was not made transparently. The next challenge uncovered was how to deliver healthcare (Fig. 1). The interviews revealed some consensus: that best-practice management of individuals (such as which medication should be used to treat hypertension or diabetes) could generally be agreed; that NCD care should be integrated horizontally into healthcare systems; and that effective NCD management requires continuity of care. However, the data also pointed to a mismatch between opposing approaches to healthcare. NCD care can broadly be divided into three levels: primary prevention focuses on averting occurrence of disease; secondary prevention aims to identify and manage illness amenable to treatment; and tertiary prevention aims to reduce complications . International stakeholders favoured a focus on primary and secondary prevention, whereas local participants favoured specialist care to treat illness and manage complications. The international model focused on delivery at primary care or community level. All participants agreed that the conflict environment created specific local challenges for implementing primary prevention strategies. As one international participant described: “People smoke more because they’re stressed and bored, …. healthy food is expensive and not available… going out jogging every morning is not top on your list of priorities.” One international participant highlighted the lack of awareness of the importance of early management of illness: “People don’t recognise why they’re treating hypertension, [they] don’t think about what they’re doing, that they’re trying to prevent heart attacks and strokes and kidney failure.” As another international participant working with local HCWs explained: “Working in the north of Syria, after 6 years, the conversation is the same, there was a total movement away from primary care.” In general, international participants reported frustration that the benefits of prevention were not appreciated locally. The local model was based on delivery at the specialist level. Most participants felt referral routes for specialist care across borders were problematic, and an international participant described: “The process of referral to Turkey is really hard. The referral mechanism has a long process.” However, whereas international participants aimed to strengthen this referral route, local participants wanted to strengthen the in-country provision of specialist care, saying: “many NCDs need tertiary units, and tertiary services”. They expressed frustration at the lack of access to diagnostic tests and treatment, reporting that this was the main priority. Some international participants felt this focus on in-country specialist services was excessive, as one international participant described: “partners on the ground want their toys, they want big diagnostic equipment, they want it to be how it was before the war.” This was a marked difference in attitudes towards specialist care. This was mirrored by international participants. A basic package of NCD care includes generic medications, as these are cheaper than branded equivalents. An international participant described the difficulties in delivering standardised approaches: “We tried to match their medications, but they’d say “no, we were taking the blue pill before. This one, it’s not blue, I want the blue pill.”” These expectations reduced the acceptability of delivering NCD care in primary care. The model of healthcare delivery, via primary or specialist care, was an area on which participants had clear opposing views. The Syrian conflict has caused unpredictability, insecurity, political discord, and infrastructure collapse, resulting in challenges to resource distribution and access. As such, this creates a challenge to implementation (Fig. 1) by impacting logistics of running services, as well as access to services. Syria is a complex emergency, with varying health needs across locations. A WHO participant explained this complexity: “It is not simply a conflict, or post-conflict or transition state. The needs change from month to month on a short time scale.” As a WHO participant summarised: “You know, there is not one Syria, there are many Syrias within Syria.” International participants described variable access to healthcare and disruption to the infrastructure: “There are good days and bad days, life goes on. Staff would tell me “my cousin had a wedding last week”, in other areas they’re living in a bunker.” Some participants described difficulties of maintaining continuity of care to a mobile population, and how healthcare needs changed; flexibility and responsiveness in service delivery and resource allocation were therefore required. All participants agreed NCDs should be horizontally integrated into healthcare. Several international participants emphasised the need to build resilience, with a WHO participant reporting: “Redundancy is important. [If] you have a central facility managing a condition or a group of patients, and it’s the only one, it becomes difficult to continue care.” All agreed that NCD healthcare provision requires system resilience. Additional resources were also required to improve security, as a local participant explained: “establishing underground hospitals, fortifying hospitals, due to direct targeting of all facilities; this consumes considerable amount of money.” This would increase the resources required to provide healthcare in this context. Conflict impacts service provision, but also endangers lives of HCWs in this environment, which creates a moral quandary as providing health may increase risk for HCWs. Finally, participants highlighted how the interactions and relationships among stakeholders impacted all other challenges outlined (Fig. 1). Healthcare and war clearly have competing objectives, and there was widespread agreement regarding the complex challenges this brings, including clear leadership, trust and power dynamics. The consequence of disrupted governance was corruption. Many participants reported incidents of corruption, with a local participant saying: “The corruption was real unfortunately.” The scale of corruption was felt to be significant by international participants: “There’s more corruption in this environment than I’ve ever seen in the civil society types of movements elsewhere.” This has resulted in restrictions to funding, programmes and negatively impacted on healthcare programmes. Participants strongly felt that healthcare was used to try to alter power dynamics. Our study described factors directly influencing NCD healthcare provision, by impacting policy creation and healthcare implementation at several levels. Figure 2 shows key upstream aspects that emerged as reasons for these factors: the pre-conflict setting, actors involved, and the conflict itself. The actors include international and local agencies and individuals, and the population. These upstream context-specific factors are not independent from each other. 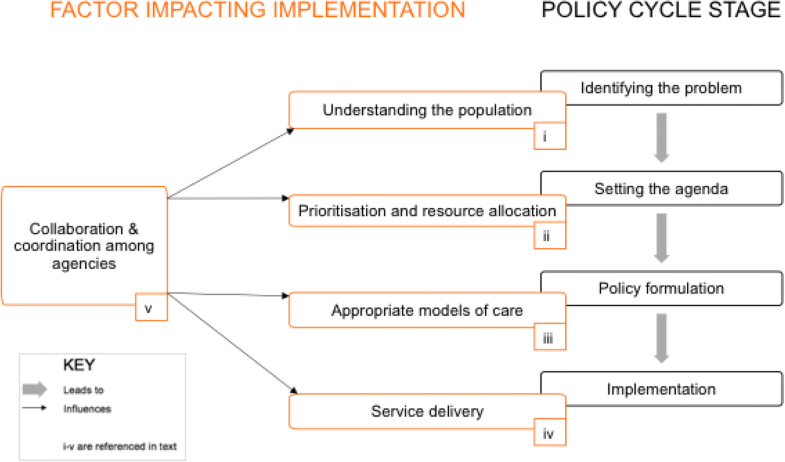 The causal relationship between these and factors impacting implementation are mediated by three key themes (A, B and C in Fig. 2) as explained below, with the references in brackets (e.g. a1) relating to those in Fig. 2. Social views and values refer to how individuals, populations and organisations see the world, and determine what is most important. NCD healthcare provision within Syria is dependent on defining the scope of the problem and setting the agenda (a1). Defining population need is value-driven (a2), since it depends on what health means . NCDs compete with other NCDs as well as other health and non-health priorities. Trauma care was prioritised, as seen elsewhere . We have shown the challenges in gathering a unified vision, with shared goals and objectives. This is a reflection of different world perspectives, different approaches to health priorities, and different understanding of what societies value. Top-down and bottom-up factors influenced prioritisation. Bottom-up influencers were the population voice, direct fieldwork experiences, and ground needs assessments. HCWs spoke emotively of the population’s daily struggles, echoing descriptions elsewhere of competing priorities due to loss of shelter and income . There were references to the “invisible” population of Syria, who do not seek healthcare themselves, who may be isolated or stay at home. This includes less mobile people such as the elderly and those with physical disabilities. The lack of input from beneficiaries, especially from this “invisible” population, was clear. Top-down influencers were donors, with inflexible frameworks for funding. Participants reported these were the most influential in determining priorities. International participants were constantly aware of mandates and agendas, funding, and models of healthcare used elsewhere. People’s values reflect training and experiences (a3). The pre-conflict healthcare system influenced both HCWs and the beneficiaries (a4), which was reflected in expectations of receiving care and priorities in care. This exemplifies the importance of understanding the pre-conflict context. Political interactions and relationships amongst individuals and agencies impact all areas of NCD healthcare provision, through collaboration and coordination (b1). These relationships are complex, including opposition and government-controlled areas; international communities and other countries; and between and within international agencies. The delicate nature of these interactions was clear throughout (b2). Syria is at war, in a struggle for power (b3). This dynamic process had periods of variable stability and collaboration, influenced by pre-conflict relationships (b4). Healthcare became a political tool at all levels, international, local, and even as part of the conflict. The agendas of organisations (b5) and lack of transparency in decision-making processes hampered collaboration and created a power imbalance between funding agencies and providers. The link between funding and power was evident throughout as the funding agencies’ power pervaded discussions due to their influence on agenda and vision (b6). The scramble for funding often overshadowed needs-based assessment. Challenges to governance are described elsewhere, due to the presence of multiple actors, including the Damascus regime, opposition forces, local councils, and the Islamic State . The impact of ambiguous governance is evident through corruption incidents, and challenges to quality control. The latter is magnified by the need to work remotely in besieged areas. Security influences multiple processes, including gathering data (c1), planning services, and implementation (c2). This is the largest determinant of service delivery due to chronic infrastructure collapse leading to shortages of HCWs, medicines and equipment. Conflict impacts on models of care (c3) since continuity of care and healthy lifestyles become more challenging in displaced populations. The physical environment and security are, however, dynamically dependent on the conflict’s evolution (c4). This area is complex: security is dependent on politics and conflict (c5), but is influenced by health actors (c6) through témoignage and advocacy. Additional resources are required for healthcare structure fortification, increasing the pressure on already limited resources. The lack of reliable access creates further challenges for continuity of care. NCD-related mortality is rising, accounting for almost 69,000 deaths in Syria in 2015 , half of which were in people younger than 70 years . Refugee studies have reported that 1 in 5 Syrian refugees have at least one NCD, with a quarter unable to seek care . Unmet health needs of those in country are likely to be high due to vulnerable populations . WHO estimates that 80% of CVD and DM can be prevented through risk-factor modification . However NCDs do not gain the same attention as other more immediate needs . The UNIATF brief does not outline an approach to prioritisation . Stakeholders had different views and services were based on perceived need. The lack of consensus on benefits of long term care made it difficult to achieve consensus on the appropriate package of services. Our findings re-affirm this by highlighting disconnect between viewpoints of international and local stakeholders, and the disagreement regarding balancing immediate needs versus long-term health investment. Participants in the interviews mostly worked in opposition-controlled areas, which is a source of selection bias. Interviews are two-way processes, and the interviewer (SG) has experience of working as a front-line healthcare worker in conflict settings; this would inevitably have some impact on the responses. Care was taken during the interviews to use open questions and neutral responses to minimise this. In some cases, the participant may not have been willing to speak honestly about their experiences, or be seen to criticise organisations. Using an interpreter for the Arabic speakers was particularly challenging, as some intricacies of the questions were lost. While our study examined challenges in policy-making and implementation, it did not capture beneficiary perceptions of actual access to and quality of healthcare. Moreover, we considered that our qualitative approach would be less useful for documenting actual service performance (availability, coverage, quality), for which objective indicators would be more informative. The historical context, current situation, actors and their relationships, all interacted to affect NCD care in Syria. Our findings can help explain challenges encountered, and plan on how to overcome these. The NCD response in Syria does not fit neatly into either the UNIATF (UN Interagency Task Force on NCDs) “initial” or “continuing” response scenarios . The “initial” approach focuses on emergency rather than continuity of care, and the “continuing” approach is challenging to implement in a context with unpredictable security. Implementation of NCD care requires flexibility and contextual insight. Defining the problem requires a coordinated approach between agencies to share data , which would be facilitated by standardising information collection methods. The beneficiaries’ voice was largely absent: service planning should involve the population at all levels . Working closely with local actors and social scientists would improve this understanding. Further evidence is required regarding the long-term benefits of NCD care in conflict situations, including cost-effectiveness. Challenges in prioritisation in crises are not new  and a transparent approach is required to prioritise across health service areas (e.g. mental health, vaccination, nutrition) and within areas, e.g. oncology. This paper calls for a resource allocation framework for ethical and fair distribution  to improve accountability and equity. Such a framework should not be unique to NCD care or Syria, and instead be adopted globally. The authors would like to thank the participants for taking part in this research, and giving their time and expertise. This research was conducted by SG during their masters in the Public Health at the London School of Hygiene and Tropical Medicine. FC was supported by UK Research and Innovation as part of the Global Challenges Research Fund, grant number ES/P010873/1. SG conducted the literature review, interviewed all participants, analysed the data and was the principle author in writing the manuscript. FC and BC provided guidance in methodological approaches, reviewed and commented on the manuscript. All authors read and approved the final manuscript. Ethical approval was obtained by the London School of Hygiene and Tropical Medicine Research Ethics Committee, ethics application reference number 14019. No individual participant has been identified in this research. Consent for publication of opinions including direct quotations was obtained in advance from all participants in writing. Demaio A, Jamieson J, Horn R, de Courten M, Tellier S. Non-communicable diseases in emergencies: a call to action. PLoS Curr. 2013 [cited 6 Aug 2017]. [8pg] Available from: https://doi.org/10.1371/currents.dis.53e08b951d59ff913ab8b9bb51c4d0de. Spiegel PB. The humanitarian system is not just broke, but broken: recommendations for future humanitarian action. Lancet. 2017; [cited 23 Aug 2017]. [8pg] Available from: https://doi.org/10.1016/s0140-6736(17)31278-3. Heudtlass P, Speybroeck N, Guha-Sapir D. Excess mortality in refugees, internally displaced persons and resident populations in complex humanitarian emergencies (1998–2012): insights from operational data. Confl Heal. 2016;10:15. [cited 04 Aug 2017]. [15pg] https://doi.org/10.1186/s13031-016-0082-9. Barnett-Page E, Thomas J. Methods for the synthesis of qualitative research: a critical review. BMC Med Res Methodol. 2009;9:59 [cited 4 Aug 2017]. [11 pg]. Available from: https://doi.org/10.1186/1471-2288-9-59. Ridde V. Policy Implementation in an African State: An extension of Kingdon’s multiple-streams approach. Public Administration. 2009;87(4):938–54 [cited 29 Aug 2017] Available from: https://doi.org/10.1111/j.1467-9299.2009.01792.x. World Health Organization. Constitution of WHO: principles. Geneva: WHO; 2017. [cited 2 Sept 2017]. Available from: http://www.who.int/about/mission/en/.